Organization accounts allow multiple Kumu users to collaborate seamlessly, with fine-tuned permissions (view, edit, and admin) for each of the organization&apos;s projects. This makes organization accounts a great fit for teams of people that have several active Kumu users. Free, on-demand PDFs. Say goodbye to $5 charges and say hello to unlimited, automated PDFs. Need tweaks the automated process can’t handle? Email us to request a PDF, free of charge, with a ~ 1 day turnaround. Private project archiving. Have private projects you want to continue to share through Kumu but don’t need to edit? Simply archive the project and you’ll no longer need to pay for it. Project-wide activity feed. Collaborating with a large team to build out your map? Use the activity feed to keep tabs on who’s making each change across your project. Real-time, embedded comments. You’ve done the work of building your map, let us do the heavy lifting to collect the feedback. Engage in discussions and link them to specific elements, connections, and loops. Use comments to brainstorm ideas and make it easy for others to give feedback while you’re building out your map. Hourly backups, retained for six months. Map freely, knowing you have backups of your project data in case you make a mistake. Customized branding. Replace Kumu&apos;s logos with your own to align your projects with your brand. Google Analytics tracking. See how many people are visiting your maps, what items those people are clicking on, and when all that activity is happening. Go to your personal account&apos;s dashboard, then navigate to the Organizations tab and click the New Organization button. You&apos;ll be prompted to give your new organization a name, a username, a billing email, and a plan—then, you&apos;ll have a brand new organization! Owners can add new members, and they have full access to everything within the organization. The creator of the organization account is an Owner by default. Owners also have admin access to update billing and profile information. Members can see a list of all projects owned by the organization, and they can create new projects, but they can only open projects they&apos;ve been given access to. Next, you&apos;ll want to create a project for your organization. This works just like it does for personal accounts—simply click the New Project button, fill out the required information, and you&apos;ll be ready to go. Once you have a project, you can start granting access to other users. If you have the project open, you can go into the project settings menu and click Members to search for and add other users to the project. These users can be existing members of your organization, but you can also add any personal Kumu account. This is useful when, for example, you&apos;re creating a project for a client, and you want them to view that project, but you don&apos;t want to add them to your Kumu organization. Of course, if you have a lot of projects or a lot of users, it would be tedious to add the same users with the same permissions to every single project! To solve that problem, you can use team-based access. Teams are very useful when you want to assign project permissions quickly, without opening up each project. 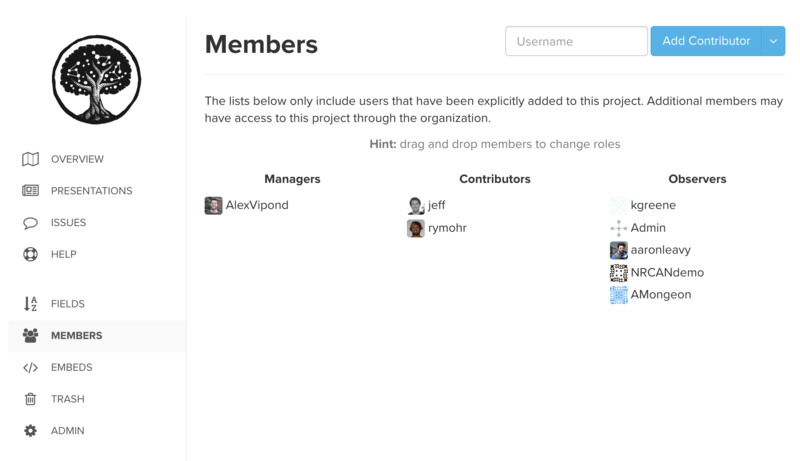 You can add your organization&apos;s owners and members to teams, then grant a specific project permission to the team itself—each user inside the team will instantly be given that same permission for the project. If you have a lot of projects and/or a lot of Kumu users in your organization, this will be much faster than assigning project permissions to every single individual, for every single project! To create a team, go to your organization dashboard and click the New Team button. Then, use the modal that pops up to add users to the team. You can also decide whether you want those users to be "maintainers". 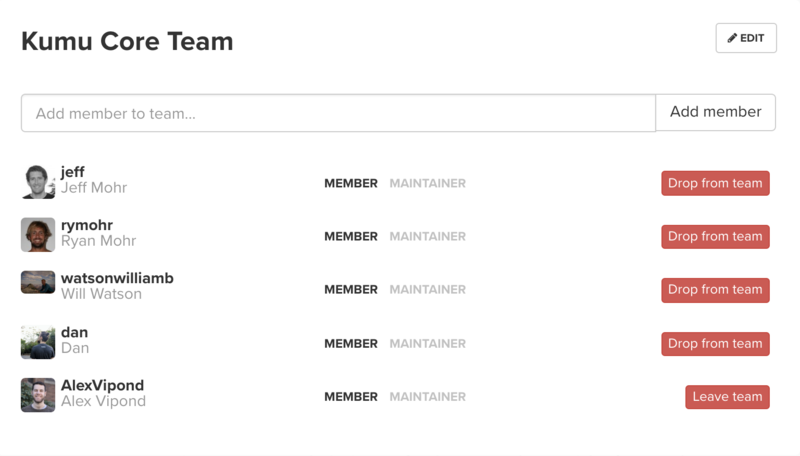 Maintainers can add and remove users to and from the team. When your team is all set up, click on one of your organization&apos;s projects to bring up the project access modal. Choose whether the team has no access, view-only access, edit access, or admin access (includes the ability to add users to the project, rename the project, and delete the project). Now that you&apos;ve mastered the basics of adding users, check out the next sections to learn how to use other features exclusive to organization accounts. To manage your branding settings, go to your organization&apos;s dashboard and scroll down to the Branding section. Organization accounts can use Google Analytics tracking to see how many people are visiting their maps, what items those people are clicking on, and when all that activity is happening. To learn how to set up tracking for your organization, check out our full guide on tracking. To convert your personal account to an organization account, you can follow the steps above to create a new organization, and then you&apos;ll need to transfer your personal projects into the organization. To do that, check out our guide on transferring projects.